A path especially created by our experiences and our choices. to remember where you've been and and where you are going. and even the challenges that you faced. We often read stories of great men and women. they did not become great overnight. All that greatness didn't come the moment they were born. and the way they chose to react to those experiences. the greatness that we too possess. to shine bright in our SOULFUL BRILLIANCE! recording your journey as the authentic you. and be whatever people needed me to be at the time. I wasn't being my true self. and see all the negative things in my life. and how my experiences led me to it! and how I am a strong, courageous person. and that I have the power to do it again! you were created to do! you may forget about them and the true lessons they taught. and a reminder that you have been prepared for the challenges you now face. Your rejoicing when you finally achieved." First find your journal, or go purchase a new one. It doesn't need to be fancy or colorful (unless you want it to be). I will record the next part of my heroic journey in. just get started! Sometimes that is the hardest part. *Write about what you are grateful for and why you are grateful for it. *Write down your goals for the day, week, or month, and each night before going to bed record how you are doing with them. *Record your feelings about things that happen to you throughout the day. What did you learn? There's so much more you could write about! to record your thoughts, feelings, and breakthroughs. 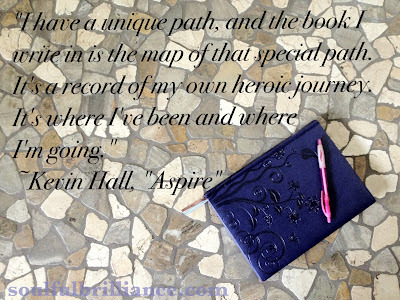 I would love to hear your thoughts about journaling! Please comment below or e-mail me at meg@soulfulbrilliance.com. you may have a small idea about what it means. I love to learn about words and the meaning they had when they first were used. I love to learn the true meaning of words. So let's take a moment to look at what the words soulful and brilliance really mean. A soul is a "spiritual and emotional part of a person". to our Heavenly Father and our emotions and feelings. "-ful" is a suffix meaning "full of". So soulful is to be full of soul and feelings. Brilliance comes from the word brilliant, which means "shining, sparkling." It is a synomym of shine, which means to "shed light or be radiant." It also means "excellence or distinction"
These things said, what is Soulful Brilliance really? It is the greatness inside you. It's the gifts, talents, and abilities that exist in the core of who you are. It is the place in you of love, truth, light, peace and wisdom. asking you to give it meaning. who you are in this life. and following the path to your greatness, your passion. that you had never thought possible. so you may light the path for them. We all desire to have purpose in life. Purpose is our driving energy in life. we find we have an infinite supply of energy and enthusiasm. Our capacity expands and becomes almost effortless. "Well, duh Meg! But how do I find my purpose." so stick with it and don't give up or tell yourself you don't have any gifts or talents. that are unique to him or her. and the power and tools we need to accomplish that purpose. We are blessed with the beautiful opportunity to have a life. This life is a time to learn and grow. To progress. We get find out who we really are. and decide that it is not for you; it's not who you are. find out who you are not! you start living life on purpose. You start living in your SOULFUL BRILLIANCE! Take out a sheet of paper and fold it in half long ways (hot dog for those of you who learned that in school), so you have two columns. On the top of the left column write "Who I am not" and underline it. On the top of the right column write "Who I am" and underline it. Don't think to hard about this, just write down the first things you think of in each column. Who are you? Who are you not? What have you discovered? Keep this paper so you may add to it throughout our journey together. I would love for you to share with us any insight or discoveries you have made! Please comment below or send me an email to meg@soulfulbrilliance.com. Hello Soulful Brilliance friends! I hope you are all enjoying your summer! As the summer is coming to an end and we are getting closer to fall, I've been doing some soul searching and working on shifting some limiting beliefs I have. For a little while I got stuck in a spot and wasn't really progressing in my path. I have heard from many of my friends and family that they are feeling stuck as well. I've had many people asking me how they know what their purpose is and what path they should follow in their life. The truth is that only you can find your path. 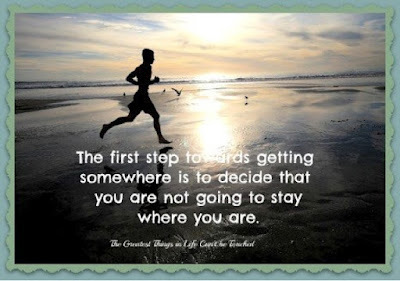 The first step on the path is to decide not to stay where you are! finding and living in your SOULFUL BRILLIANCE! Join me over the next few months as I share some different tools you can use in your search. I will also be adding new features to our blog and resources that may assist you. Check back often or like our page on Facebook where I will be posting updates. Please share this site and our Facebook Page with others so we can assist as many people as we can in finding and living in their Soulful Brilliance! A resources page full of books, websites, and much more! Introductions to our SB team! 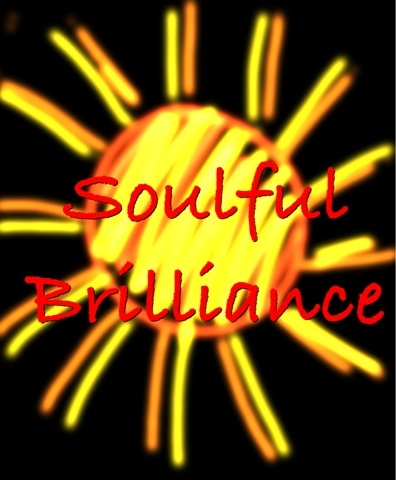 More on what Soulful Brilliance means! Why journaling is so important! Why Meg likes exclamation marks so much!